More than 30 suspected members of Sri Lanka's Tamil Tiger rebel group have been arrested in Italy in a series of raids across the country, police say. They say all of them are Sri Lankan citizens suspected of extorting funds for the Tigers, who are banned as a terrorist group by the European Union. Police said that more than 200 officers were involved in the operation. They say that the arrests have effectively dismantled the Tamil Tiger fundraising network in Italy. The BBC's David Willey in Rome says that police swooped at dawn in simultaneous raids on suspected Tamil Tiger hideouts in eight different cities - from Genoa in the north to Palermo on the Mediterranean island of Sicily. Police said they have been investigating reports for the past two years that Sri Lankans had been extorting money from fellow nationals working in Italy and sending it to Sri Lanka to finance Tamil Tiger rebels fighting government forces. Three months ago the Italian authorities closed down an illegal Tamil Tiger propaganda TV channel operating from Italian territory. There are an estimated 50,000 Sri Lankan immigrants working in Italy. Many arrived illegally but have since obtained work and residence permits, our correspondent says. 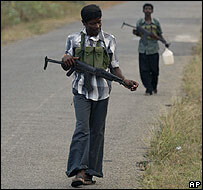 The Tigers have been fighting for a separate homeland for the Tamil minority in Sri Lanka for a generation. More than 70,000 people have died in the conflict.